The bobbing waters of Squam Lake reflect the cloud-dabbled azure sky. The pristine peaks of the White Mountains paint the horizon. A loon’s enchanting call echoes off the trees. 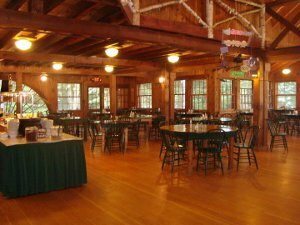 Every moment at Rockywold-Deephaven Camps in Holderness, New Hampshire is one that celebrates natural splendor. However, there is one week when this outdoor oasis truly appreciates Mother Nature’s magic. From June 22nd through the 28th, celebrate Nature Week with a wealth of informative wilderness activities that include bird watching, lake cruises, and guided hikes. What better way to start the resort’s first annual Nature Week than embarking on a daily bird watching expedition with one of the world’s foremost field ornithologists Dr. Robert Ridgely? Observe these beautiful feathered creatures in their natural habitat while Dr. Ridgely shares his expertise and answers your questions. Turn your attention to an aquatic aviator on a Loon Cruise. 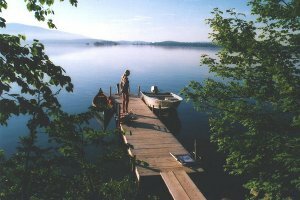 While exploring the idyllic Squam Lake, you’ll learn about loon conservation, biology, and monitoring from your expert guide. Hopefully, you’ll also get a closer look at these majestic creatures. Afterward, study the loon’s environment during the Aqua Lab. Return to solid ground for Creatures of the Night: Full Moon Hike. A tour through the naturally lit landscape gets you acquainted with the habits of nocturnal animals and a special evening presentation by singer/songwriter Steve Schuch of Night Heron Music unites music and nature. Showcasing so many outdoor adventures, you’d think that Nature Week would cost a lot of green. On the contrary. Not only are all these fun-filled excursions free of charge, this is also a five percent discounted week. And, though it is a special week, all the resort’s traditional activities are still available. Helping celebrate the environment, family togetherness, and exploration, fun comes naturally at Rockywold-Deephaven Camps.